Maria Lee and her husband, William, are expecting their second child in mid-September! He/she (they’re not finding out the gender) will join big sister, two-year-old Lily. The family is anxiously awaiting the arrival of their new little one, and the BJP Entertainment team looks forward to welcoming a new member to the BJP family! BJP Entertainment now has operations on both the East and West coasts. Maria has recently relocated to Atlanta, GA, and the BJP Entertainment team will be maintaining offices in both Los Angeles and Atlanta. Atlanta is an entertainment industry hot spot, and we’re taking advantage of what both the West and East coast markets have to offer. On the horizon for BJP Entertainment are a new web series, a reality show, and various music projects are in the works. We’re excited about the opportunities that lie ahead as BJP Entertainment goes bi-coastal! Word has it, Maria’s recent v/o project,”Alice’s Pawfect Tea Party” will be a part of THE TALK on April 28th, for National Bring Your Child to Work Day. The audience that day will include the children of the hosts, crew and THE TALK staff. THE TALK airs Monday – Friday on CBS at 1 PM (PST). We’re not exactly sure yet how “Alice” will be featured, but we know they’ve ordered 275 tea kits, so it sounds like a whole lot of folks from CBS are going to be going home and listening to Maria as Alice on her Wonderland adventures! Be sure to check back here for additional details as we learn more. 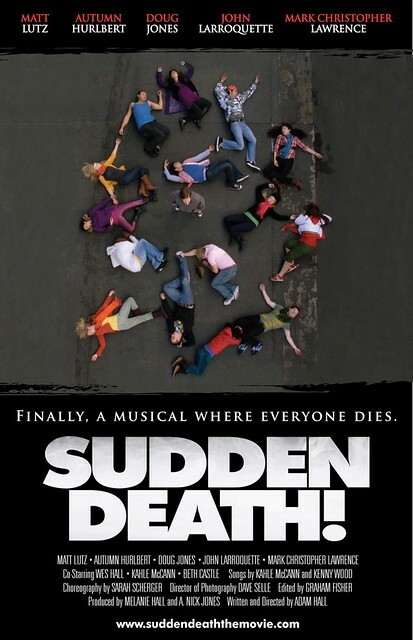 Sudden Death – the musical film Maria appeared in last year as a dancer and singer on the film’s soundtrack – has been making the film festival rounds and racking up the awards and honors. To see the list of awards, visit the film’s official website here. Also, be sure to check out Maria as a dead body on the film’s poster. She’s the body on the right dressed in red, white, and green! Maria voices Alice in Wonderland for the CD of the Storybook Tea Kit Company’s “Alice’s Pawfect Tea Party” kit, an interactive gift set. Tea guests play the cd, and Alice herself leads the tea party back to Wonderland. Themed elements of the story are turned into chocolates and cookies. Check out the behind the scenes video of Maria in the studio. Visit the Storybook Tea Kit Company’s website and hear a clip of Maria’s work on the CD here.